At the dawn of the French Revolution, you play the leader of a group of revolutionaries and you try to position your men at best, so as to be ready when the Revolution begins. You will need money, influence, good leaders, weapons, and more to survive during this difficult time. 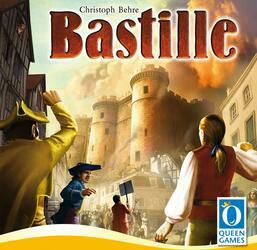 Bastille is an auction game in which each player has three tiles of influence which he will have to place, one by one, in one of the seven buildings which surround Paris. Once all the tiles have been placed, the players evaluate each building, starting each time with the player who has placed the strongest tile and who, therefore, will get a bonus. But beware, there are only three places in each building, so you need to think carefully about what you want to do. Each turn, a random mission tile is unveiled and indicates which of the different symbols or items collected by the players will earn bonus victory points at the end of the turn. At the end of rounds 4 and 8 (end of the game), the players earn points for the leaders they have recruited, for their advancement on the track of the Bastille and for the secret missions they have recovered over the years. Of the game. The player with the most victory points at the end of the 8 rounds of play is declared the winner and becomes the new leader of the Revolution!